The pulse-pounding new thriller featuring Cotton Malone. Perfect for fans of Dan Brown, Sam Bourne and Scott Mariani. The pope is dead. Cardinals are beginning to arrive at the Vatican to select his replacement, but one has fled for Malta in search of a document that dates back to the 4th century and Constantine the Great. Former Justice Department operative Cotton Malone is in Italy, on the trail of legendary letters between Winston Churchill and Benito Mussolini that could re-write history. But someone else is after the same letters and, when Malone obtains and then loses them, he's plunged into a hunt that draws the attention of the legendary Knights of Malta. The knights are the only warrior-monks to survive into modern times. Now they are a global humanitarian organization, but within their ranks lurks the Secreti - an ancient sect intent on affecting the coming papal conclave. Malone races the rogue cardinal, the knights, the Secreti, and the clock to find what has been lost for centuries. Meanwhile, the election of the next pope hangs in the balance. I love Steve Berry’s books, his clever plots, and his well-painted characters, but this one left me flat, for four reasons: one general and three specific. In general, as a Catholic, I am used to authors such as Berry who dislike Catholicism, Christianity in general, and religion as a whole. Nothing new in our ultra-secular, materialist culture and it sells well. Criticism is good and necessary and often humorous. Few can argue that either faith in general or the Church in particular cannot benefit from it. But what I read was not criticism or poking fun but disdain. It is gratuitous, unnecessary, and in my opinion harms the story’s appeal. Specifically, three things consistently cause the book to ring hollow throughout, taking the energy out of the book. One, all the clerics in the story are monsters. Not one or two multifaceted characters who have chosen evil in certain actions, but all grotesque caricatures. One monster cleric is believable, but all clerics being monsters makes the bad guys ridiculous and unbelievable. Silly rather than scary. That hurts the story. At least one lowly good guy priest should have been included to make it more believable. Or a priest who does evil things believing that they are good or believing that they are necessary for a greater good. Ends justifying the means, etc. Grey is a lot more interesting and believable than everything being black or white. Second, not a single cleric or person related to the Church displays the most basic faith. Even if one believes that the Church and the Catholic faith are wholly invalid, the fact remains that priests, bishops, and archbishops do have faith. Some to be sure are cold, calculating, power hungry, and criminal, but they retain a basic faith, even if they choose evil. Even if they all lost their faith over time, they would at least speak with the language of faith, instead of the language of murderous bureaucrats as in the book. Third, finally (spoiler alert), the plot revolves around a lost 4th century blueprint document that instructs bishops on bogus doctrines to create the Church and control the masses. Again, even if one believes that the Church, its doctrines, and religion in general are wholly invalid, it is completely unbelievable that the Church or the Sovereign Military and Hospitaller Order of St. John of Jerusalem - a 906 year old Catholic lay religious order whose motto is to defend the faith and serve their Lords the poor and sick - would keep a copy of such a document. I was expecting something more clever than a piece of paper that says ‘the Church is bogus’. 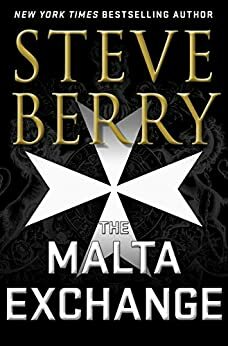 I think "The Malta Exchange" is Steve Berry at his best. I tend to disagree with those who feel otherwise. I will say right up front that I'm an avid Steve Berry reader and always eagerly await his next novel; I've read them all. I love historical fiction, and whereas, I can't place Berry's works in that category, I do enjoy the addition of those little known historical facts woven into his storylines. This is what I enjoyed most about "The Malta Exchange." I learned a lot about a period I otherwise would not have studied. Having read Berry for so long, I tend to know now what is pure fiction and what isn't. When I read his windup at the end, I'm usually not surprised anymore at what turns out to be fiction. And after all these years, I still am amazed at how artistically creative he is in his writing to be able to weave real historical facts into the storytelling the way he does. I've always loved the character of Cotton Malone, even if at times, he seems too good to be true. Berry has developed him well and is consistent from novel to novel. Recently, he's introduced Luke Daniels, and I admit to having trouble finding the same love for him, but that fact does not take away from how engaging I found this book. Yes, it's fiction...and at times...some situations that he manages to get out of may feel like a stretch...but that can apply to so many works nowadays that we find entertaining. After all, Malone is the main character. Do we really want him to be killed off? Nay! I found it hard to put this novel down and read it at night before going to bed in just a few days. I recommend it as one of, if not the best, of Berry's works. I love this writer, however, this book did not develop the NEW characters, and spent WAY too much time explaining Catholic doctrine in detail. It was a relief when it ended. Never thought I would feel this way about anything this author wrote. I’ve read and own ALL of Steve Berry’s books and always find them captivating and thrilling. I love the historical implications and Cotton seems like and “old friend”. The Malta Exchange has been just an OK read for me, I think there was too much going on with Luke and Cotton having separate story lines most of the book as well as too many points of view from the other characters. Also Luke’s flasbacks to life lessons learned growing up in Tennessee, his multitude of mentions of his Morher’s wisdom, etc. slowed down the action quite a bit and I had a hard time getting through the book with enjoyment of every word. One interesting thing that gave me food for thought was Cotton thinking about the Malone bloodline ending with him and his unease regarding that. Perhaps there is a baby in his and Cassiopeia’s future?